Cynicism is a term used to reference an attitude that is suspicious of others motives and intentions. 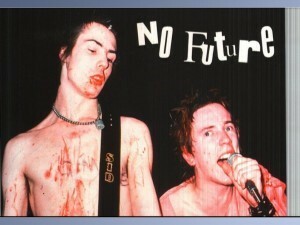 In the 1980’s punk rock was introduced as an alternative way of living and thinking. It challenged the religion, culture and opinions of society. It was a way for people to express their freedom of speech in a way that was directly visible. 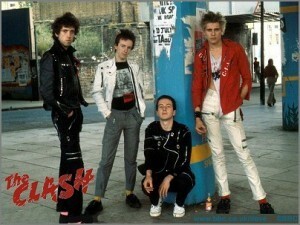 Punk rockers work clothes with profanity and suggestive nature on them. By society it was not accepted and was a way of acting out against how you should live, dress and act. Most of the punk rock age group was targeted towards late teens and early twenties. The way cynicism worked is that standards were created to keep people the same, but to some they knew they wanted to be different so they decided to follow a different path. I’m not saying that it was wrong. As long as people have their own reasoning behind their actions then it must be the right choice for them. In Figure 1 there is a description of what society feels cynicism is. The colored areas show what is acceptable and the black areas show what is unacceptable. 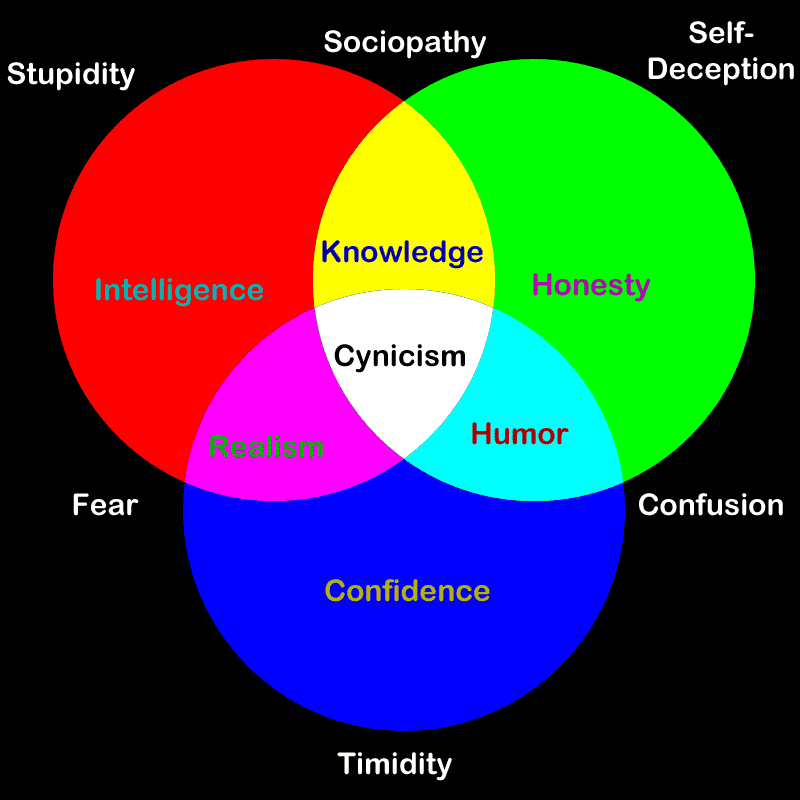 Everyone goes through these traits throughout their entire life, so to me I feel that if this is what they believe cynicism is, then we are all cynics. Pop culture focused on rebelling against normal means and standards and so were adolescents. Everyone knew change was in the air, cynicism was just one way of making progress. Not everyone thinks alike. We all have different views, opinions, values and desires. It is normal for people to act out, but it was un-normal for the way that they did it. Pop culture introduced people to expression that was eventually accepted by society so why couldn’t people express themselves through clothing, style and behavior? I personally understand why cynicism was such a popular statement. When you are growing up, you are trying to figure yourself out and need to express yourself. Our adolescent phase is a critical time in our lives because we are going through so many changes. Rebellion, violent attitudes, style statements are some of the things we glean towards because it is the complete opposite of what our elders are like (shown in figure 2 & 3). We want to be different and creative so we reject what is laid before us for our future. To me cynicism is just a challenge to overcome. It does not harm our society. People will always make personal choices that could harm themselves or someone else, but that does not make their freedom to express themselves and challenge our world wrong. Change is never ending, so once we accept new changes in our future we can be able to live a fulfilling life. Our society is not perfect by no means. We have faults in ethical, political and social values. For someone to be brave enough to challenge these things, makes us recognize that there is an issue and we should address it. Perfection to one person is not perfection to all. Semiotics is the study of signs, analogies, symbolism and communication. Without semiotics what would our world be like? I personally don’t think I could image a life without some form of branding or signage. Semiotics was created to form a relationship between us and materials. 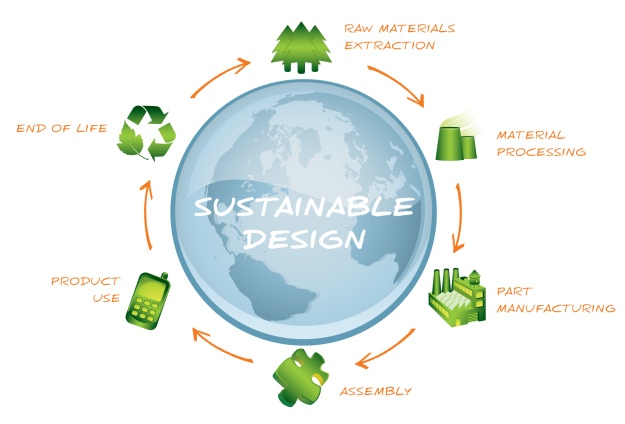 Signs dictate what we use specific things for and what company created it. Ultimately semiotics is a logo or a branding strategy. In the 1980’s and 1990’s this is when signage really took off. 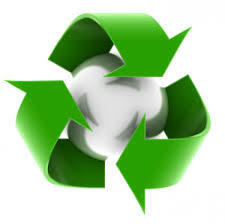 Our society was becoming more advanced with the production of transportation, electronics, appliances, and food joints. We focused on luxury living that revolved around entertainment and aesthetics. Take something simple and make it more attractive. It doesn’t matter if the item itself was useful or not or needed modification. Semiotics allowed people to display recognizable images and words across almost anything so that people would remember them and be drawn to it. Symbols were also incorporated into this mix so that people could understand the action quickly without being too distracted. 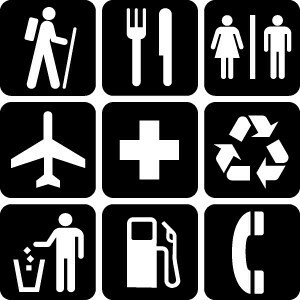 For example symbols for food, gas and washrooms were easy to read and understand while driving past on the road (shown in figure 1). It grabbed people’s attention, made them think and persuaded them to act. This form of semiotics I feel was beneficial to our society because it helped us get the point across without being over powering and distracting. Simple images, logos and signs made a significant difference on our society and I am thankful for it, but when you take a good idea and push it too far that is when things go bad. Not everything was able to be redeveloped. Buildings took a lot more time, effort and money to change opposed to small products and signs. The idea of plastering a fake appearance over top of an already existing building to conform to the new “look” was a lot cheaper. It was a smart idea to say the least but was it necessary? This relates to semiotics because if someone sees an image they recognize they are more willing to trust and accept it opposed to something new. Monuments were imposed to draw every more attention and business to one location over another. It did more than draw attention though, it made us think, feel and react in a certain way. For example MacDonald’s deveopled the big gold “M” archway to signify people where they were. The jingle instantly comes to mind and so does the mascot and the craving for delicious deep fried food. One image triggered a chain reaction of multiple thoughts within a matter of seconds (Shown in figure 2). It was a brilliant strategy at first but the lifelong effects it had upon our world is devastating. It seems that now all we want is cheap fast deep fried food, horrible service and a city plastered with glowing lights trying to draw your attention. 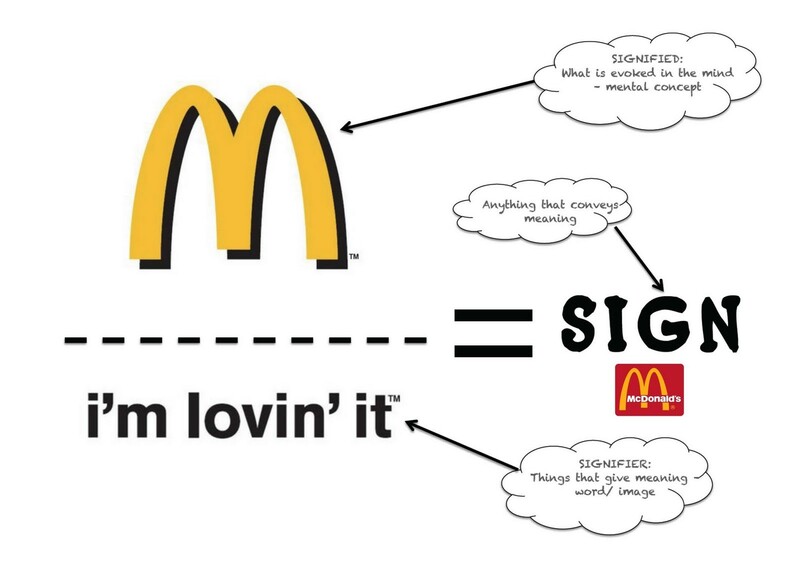 Semiotics started out as simple symbols, images and logos but later progressed to branding and marketing strategies. It escalated quickly into something that our society became reliant upon and competitive with. It was not about getting a message across anymore. It was about being bigger, better and bolder. We associated everything now a days with brands. The creation of Semiotics was inventive and ingenious, but the effects it had on our society was not very beneficial. It made us become reliant on color and images. We are attracted to signs that display colorful images and logos. The bigger the sign is the better it must be. The invention of semiotics has turned our world upside down and made mankind materialists. We brand logos on everything now a days. Signs, clothing, accessories. If something doesn’t have a logo or brand plastered somewhere on it then it must not be good. As much as some of us say we do not care where it comes from the fact is we all do. Once you learn where its origin is or which company produced it, we instantly have an impression in our mind either good or bad. We base our impressions off of personal past experiences and also word of mouth publicity. There is no landscape, no simplicity to life, no natural beauty anymore. We took a good idea and ruined our world by mass over production. We cannot get away from it because we drilled it into our everyday lives. The kitchen was first known as a wife’s workshop. She would spend hours every day prepping and slaving over a hot stove to create the perfect meal for her husband. She as well had other household duties to attend to such as; taking care of the children, gardening, and laundry and cleaning the house. This was the normal way of life in the 1950’s. After the end of World War II couples wanted to reconnect and start building a life as well as a family together. During the wartime efforts woman left their home duties to help their country. This meant that many chores and meals were not as highly prepared and accomplished. 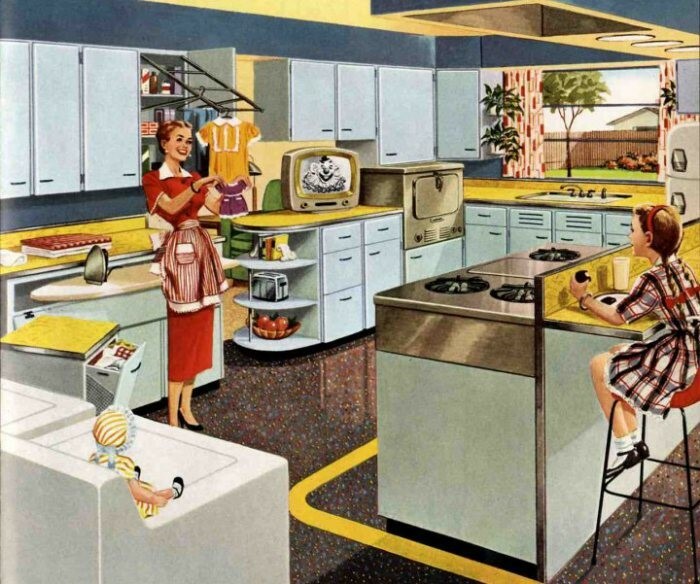 Around 1953 kitchens started to become less compact and more open concept (see Figure 1). Instead of being confined to one small tight space, the idea was to provide lots of space that combined many functions and features within it. 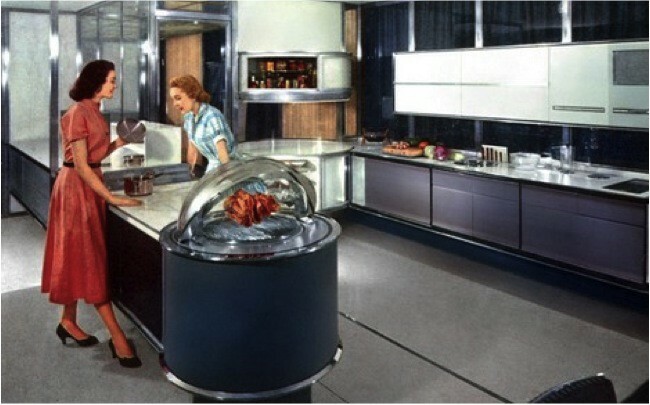 This is where the “Dream Kitchen of Tomorrow” concept was developed in 1957. 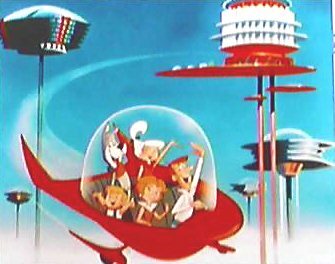 Frigidaire was the company that started to really develop this concept into a futuristic view. Incorporating the open concept kitchen as well as new technologies that increased the efficiency of cooking. It was no longer needed for woman to organize their daily itinerary around the prep duration and cook time of the meal. Fridges were designed to keep food chilled at a desired temperature without freezing them. Ovens concepts were designed to be able to see the food cooking while you are tending to another activity (see Figure 2). The rotating fridge’s purpose was to allow the milk man to deliver the milk jugs and provide it to every house hold without the health risk factors of leaving it on the door step. It would go directly into the fridge from the outside of the house so that it could be rotated around so that anyone who needed milk would have it accessible to them. 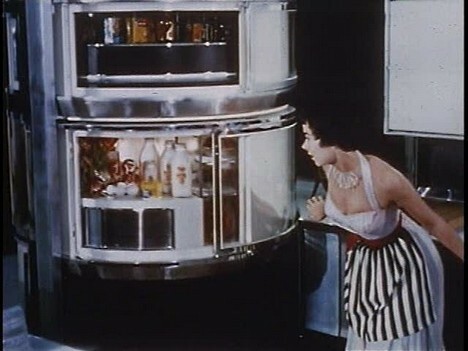 Another feature that was designed to be implemented into the “Dream Kitchen of Tomorrow” was a lazy Susan glass fridge (see Figure 3) that allowed you to view the contents within the fridge without having to open it up. All these ideas were wonderful to an extent. Some things died down with time such as the milk man delivering milk each door step. Now a days we travel to the grocery store to acquire our own food selection. The glass fridge to me seems a bit strange though. Not everyone can keep a clean fridge so having it displayed to your guests could be unappealing. I do agree with the open concept kitchen style. They made use of space and storage to be efficient and functional. 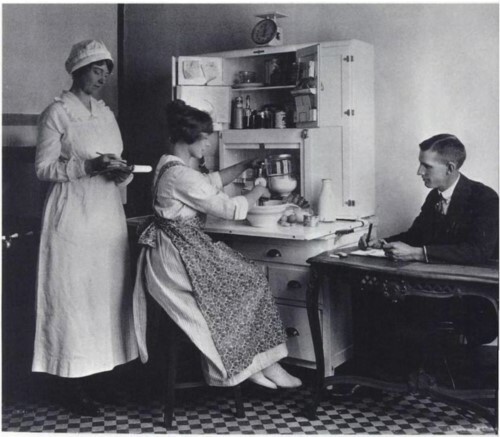 Although the “Dream Kitchen of Tomorrow” was mainly designed to benefit the ladies of the household it has now progressed to being beneficial for everyone. The goal behind building a new kitchen built to fit our life seems like a perfect concept. People really tried to adapt the kitchen around our lives but they seemed to think of ways in which they think we will use it opposed to how people would actually use it. Some of the futuristic equipment that was designed was not realistic or practical. Other things on the other hand were, which allowed for us to make progress with kitchen designs. Kitchen design concepts keep changing between multiple styles and functions. Everyone is different which makes having different layouts such as open concept and galley kitchens useful in our society today. People want to have a space designed around their needs, functions and wants rather than being told what they should have and how to use it. The designer Max Clendinning caught my attention through his colourful choices in furniture and décor throughout a space. His unique style focuses more on the space which you are in opposed to the furniture within it. Max Clendinning was born in County Armagh, Northern Ireland in 1924. His passion growing up was architecture and interior design and how to mix the two together without being over dramatic on certain areas. 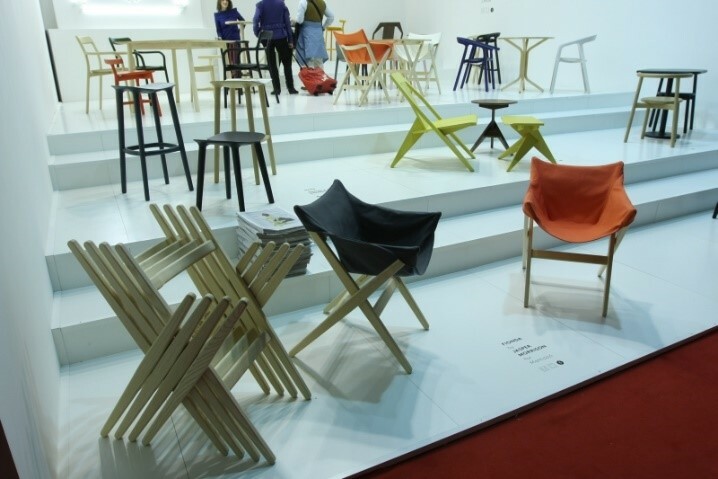 As a designer he displayed his artworks and furniture in shows to inspire people to think about what design really is. Design is something that changes all the time, so it can never be wrong no matter how bold and eclectic it may be. One of his most well-known works of art is his own personal residence in London, England (see Figure 1). 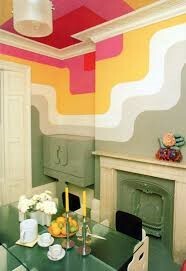 His objective was to keep the design simple and minimal but draw in people’s attention through colour and pattern. Most of Max Clendinning’s furniture pieces are quite simple. They show their use and function without being overly detailed with designs. Some of the geometric forms provide enough unique qualities with just a solid coloured paint palette (see Figure 2). His goal was to show people how to be minimalists. His first main design concept was to try and eliminate furniture altogether and have people make use of the space they are in by sitting on the floors. Max’s idea was to sculpt the space into the furniture instead of placing furniture within it. This idea concept is most definitely unique but not overly practical. With people having so many limitations and ailments it is not reasonable to have a space with fixed furniture that is sculpted into the room. 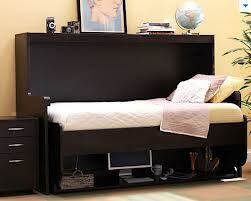 The concept needed to be reversed so that the furniture adapts to us and our needs. He realized his design faults and decided to change his works to fit society. The colour palettes on the walls provide depth and dimension as well as the furniture’s harsh corners being rounded off. It was computer lettering at the time that really inspired him to play around with all curves and angular lines. People were attracted to specific lettering so why wouldn’t they be attracted to furniture with the same features. Max Clendenning wanted to design homes as an oasis, but not a typical relaxing oasis. He wanted to create a place where you could go and feel like you were living another life. A break from reality maybe. The outside world can be harsh and busy and not focused on design and colour. Most people want to go home and relax but the view would still the same, with bland and uninspiring décor. I understand his thinking process of wanting to give people a feeling of something new in their home. I feel he had a very forward way of thinking which I like. Our society seems to be too scared of being anything other than ordinary, which is why bold designs do not get integrated into our world. He was on the right track though with creating unique furniture that was so simple and minimal and just use colour as a pull factor. Our lives can get so busy that we forget how much material items we acquire. I personally am intrigued with his designs and creative thinking because it is original. 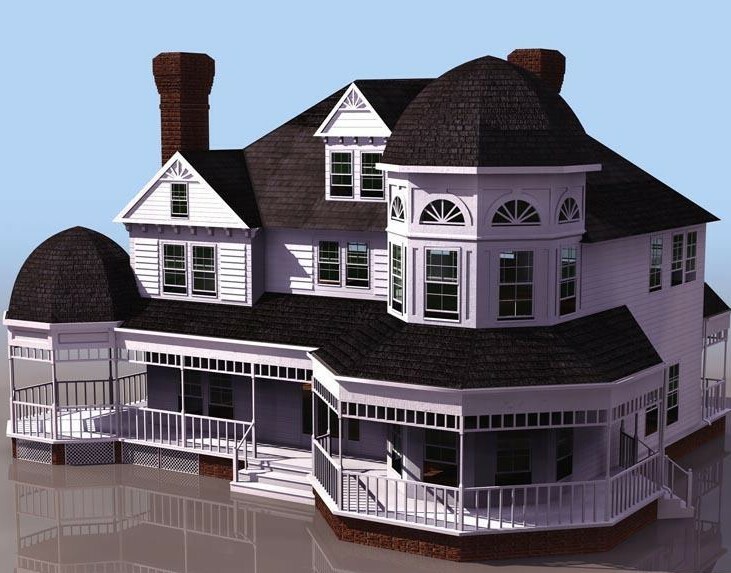 There are many interesting developments that happened throughout history but since I am fascinated with interior design it only made sense that I would want to further my knowledge on the home interiors. The most interesting thing that stood out for me is how kitchens got turned from an open concept, do everything in this tiny little room, into a more designated space used for only a few particular practices. Christine Fredrick founded this idea called Taylorism in 1912 – 1915 (shown in figure 1). Christine wrote articles that provided knowledge to woman about housekeeping, home interiors, cooking etc.. The woman’s role was to be at home and take care of the children, so why not make homes into something to brag about. Christine had the right idea about furthering people’s knowledge about daily chores and important information about things to do at home to keep busy with. I must say her best idea was when she decided kitchens were meant for cooking. Since houses were first built it was standard that the kitchen was the primary location of the house. It kept everyone warm because there was a fire, the fire had a purpose not only to provide heat but to also prepare meals over. It made sense during those times to have everything relatively close together, but as our society and culture started to grow we developed new techniques on how to prolong life but to also help make it easier. I would probably refer to this as luxury. Throughout history we kept developing that sense of luxury in everything we did. I’m not saying though that the kitchen wasn’t used as a common space anymore, because it still was, but as humans we wanted more of everything that was bigger and better. Christine Fredrick initiated the idea of making the kitchen used for only cooking activities opposed to entertaining, doing laundry and even eating. With the expansion of houses and multiple rooms as well as space that went along with it, there’s no reason that notion wouldn’t have worked. It makes sense too, why eat in the same place where you have left a mess or is overly warm from the oven. A kitchen is a place where you should keep your secret recipes and play around with flavors, not so much an entertaining location. It is especially not a good idea to have a washer, dryer and chemicals located next to food. That is a disaster waiting to happen. Yes it is convenient when you are trying to multitask. Prep food, watch the kids and do laundry, but ultimately it’s also good to leave the space, go into another new area that is focused on a different activity. There’s not a lot of information on her development with this idea, but as we know people did adapt this idea into our culture. Some people do still have laundry rooms attached to their kitchens but at least there is a safety hazard that has been established and resolved. I guess everyone likes something different and that’s the way it will always be. Kitchens are still a place meant for cooking specifically but other activities such as entertaining, watching kids and eating with in the kitchen have come back into play. Dining rooms are now meant for more formal setting where as kitchens have more of a simpler feel to them. I like the idea that Christine had started but I must admit to me a kitchen is more than just a place to cook. It is a place to socialize with friends and family, share ideas, talk about your days, and teach one another how to cook meals and to enjoy what you have just created. The open concept design is also coming back into play. I find it strange how we are so desperate to change our ways and to create something new but it seems that we ultimately keep resorting back to our history and simpler times. Yes we expand on those ideas and go in a different direction but that’s the refreshing part of things. “Women in Advertising: The Campaigners.” Advertising Age. N.p., 24 Sept. 2012. Web. 2013. "Christine Frederick." Wikipedia. N.p. : n.p., n.d. N. pag. Print. National Humanities Center. 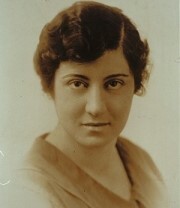 Christine Fredrick, n.d. Web. 6 Oct. 2013.